(1807-1886) was a British (Victorian) artist, an illustrator of Walter Scott's novels and Shakespeare's plays, a founder and the third President of the Manchester Academy of Fine Arts. William Knight Keeling. Love's Messenger. 1856William Knight Keeling was born in Manchester. He was apprenticed to a wood-engraver, and in the 1830s went to London and became an assistant of William Bradley (1801-1857), a Manchester-born portrait painter who moved to London in 1822 and established himself as a portrait painter. However, Keeling returned to Manchester in 1835 and firmly established himself as a popular and respected portrait and figurative painter in oils and watercolour, and a drawing-master. From 1830s, he actively exhibited in Manchester, Liverpool and elsewhere. In 1833, his painting 'The Bird's Nest' was awarded the silver medal from the Royal Manchester Institution. In 1841, he was elected a member of the New Society of Painters in Watercolours where he exhibited about 60 works. In 1859, Keeling became a founder of the Manchester Academy of Fine Arts, and its third president from 1865 to 1877. He was a member of the Manchester Literary Club and the Brasenose Club. In the 1850s, following the notion of the day, he travelled to Spain. This journey gave him new ideas, subjects, and motifs. Delicate details and clear and bright palette inspired by hot colours of the South, are distinctive features of his paintings and watercolours. In 1873, a Manchester newspaper praised one of his watercolours as "an exquisite work, perfectly Spanish". He also was influenced by works by the great Spanish artist Bartolome Esteban Murillo (1617-1682). Murilloes street children can be easily recognised in Keelinges compassionate depictions of poor children, both British and Spanish. His eSpanish Boye exhibited in Manchester in 1876, was described as "a very good example of the careful and accurate method pursued by the artist. He is thoroughly conscientious in all his professional work." 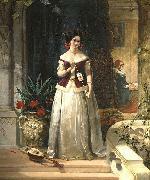 In 1851, in London, Keeling married Mary Ann Charker (b.1822). They had four children: Edith (b.1852), Dalton Harper (b.1853), Sidney Charles (b.1859), and Gertrude Ann (b.1862). Keeling died on 21.02.1886 in his house at Barton-upon-Irwell, Manchester. Keeling did not strive for fame and glory, and remained in the background of the artistic life of his time, although many connoisseurs appreciated his works. Several his works have been preserved at Victoria & Albert Museum, London. In the 1870s, Wolverhampton industrialist and collector Sidney Cartwright purchased from a Manchester exhibition a large number of Keelinges works. In 1887, they were given to Wolverhampton Art Gallery which possesses today possibly the largest collection of Keelinges paitings and watercolours in the United Kingdom.